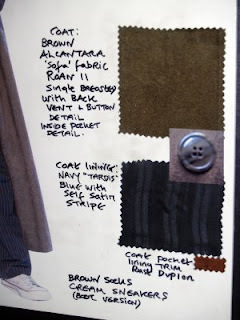 Making My Tennant Coat: ALCANTARA - where do we go from here? Louise Page, the costume designer for the series had long maintained that the material used for the coat had been discontinued, so it was impossible to find now. Not letting a minor thing that that put me off, I set about tracking it down. And what did that 'ROAN 11' mean? Obvious internet searches brought up a variety of sources for the material, but nothing obviously the right one. My next point of call was the various Doctor Who forums to see what they had to say, as the news of this display at Earl's Court had hit big with everyone. There was a lot of discussion and debate about it, with various people recounting the leads they had found and the dead ends they had reached. 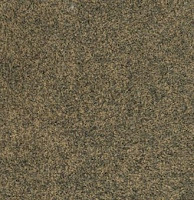 Then I found, hidden away on an obscure distributor's site an apparently forgotten range of Alcantara material. Could this be the one? It had a flecking to the colour - that seemed to match. Maybe it was the one. Could I have found it? I asked for a sample of the colour I thought best matched it, in fact I asked for the entire swatch card for the whole range. But alas, being part of a discontinued range, no-one had any swatches left, let alone any actual material. One of the contacts I tracked down was more than willing to help. He was a UK distributor for Alcantara and told me that if I order at least 200 metres, it would be feasible to re-weave the colour I wanted from the discontinued range. Anything less it would not be worth their while. That was great news. 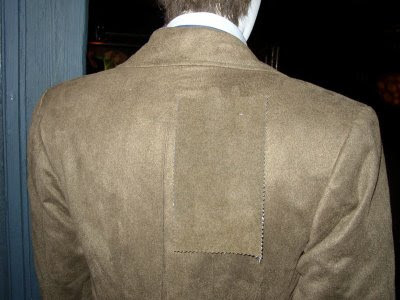 I had seen some instances of 'group-buying' on the costuming forums, so thought this would be an ideal way of making it available again - not only for myself, but for anyone else who was up for having a good go at making their own coat. I also thought that if I could interest some of the replica costume makers, such as Magnoli, Baron's Boutique and maybe Cloth Ears, they could be alloted a large part of the run, leaving enough for the individuals to get what they needed too. So, I put it to the forum on www.doctorwhoforums.com to see what they thought. Here is what I posted (you will need to be logged in to view it). Well, I wasn't quite prepared for the reaction I would get. Within a few hours of my inital posting. My dilemma was this: I had found the range it came from. I could not specifically pin-point the colour as I could not (at that time) find a swatch. BUT we could get it re-woven - so anyone up for it? It would coat around £35 a metre. if you can get another person to identify this a defiantly the material then that is great, until then don't bother magnoli, BB, or clotheirs. I am already working with BB to try and get the correct alcantara and have emailed magnoli earlier this week about accurate fabrics. so for those two your are wasting your time anyway. secondly unless you can get a price considerably cheaper than that, then i don't think many people will be able to afford it. Now, I can tell you Alcantara is expensive - eyewateringly expensive. I later found the right material available for over £100 a metre. So £35 aint bad!!! From then on, no matter what I said, I got attacked. 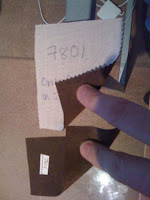 I had found some samples of Alcantara that were intended for upholstery use and had a hessian backing. Others were for use as curtain material and did not have a backing. One guys told me, in no uncertain terms, that it never had a back, although I had a sample in hand. I took a picture to show him the same colour with and without a backing - but he latched onto the colour (which was a chocolate, so I was never claiming it to be THE colour) and denounced me as trying to make people buy material of clearly the wrong colour. Referring to the Malabar match I had found the year before. I think lying was a bit strong. I had found a decent match. Just look at the pictures earlier in this blog. I think I did pretty well to find a material that was that close. He obviously didn’t seem to appreciate my efforts. He later apologised, realising he had been a little hasty with his comments and has since become a close online friend and has been very supportive of what I have been trying to do. In fact we are now collaborating on a number of projects, such as trying to replicate the trouser fabric for Peter Davison’s costume. But at the time the damage had been done, and I think it was around this point I backed away from that forum, having been left quite raw at how I had been treated. The dw_cosplay forum is populated with so many really nice people - all supporting each other and sharing ideas. doctorwhoforum was a whole different experience that I wasn't prepared for. So, I decided to carry on my search and find it for myself and to hell with the rest of them. Well, I DID find it - and as I said before - at an eyewatering price (£75 a metre) - but I did find it. All I will say is that I had to go further afield than anyone ever thought. Far further. It's amazing how the internet can bring far off lands so close. I have absolutely no intention of revealing the colourway here, or anywhere else for that matter, as I know it would get back to those idiots on the forum, with whom I want nothing to do with ever again. Though they have written to me off forum pleading pitifully to know what I had found. I did leave them this final passing shot though, just to rub their noses in it, taken on a return visit to the exhibition with the final swatch of the Alcantara I tracked down. I now have my Alcantara from the right fabric range, in the correct colourway, and will shortly be starting work on my next version of my coat - the Mk IV . . . . I am so excited for you! Shame that you had to pay an exorbitant price because of people on the internet being nasty to you. Argh. If I had heard of the group buying option, I'd sign up in a second! PS - the shot of the Alcantara swatch lying over The Coat... Best. Picture. EVER. Do you have any fabric left? I have a few metres - why? May I ask what color it is officially? I'm trying to get the color just right.